Throughout the course of your life you may have had unusual or powerful dreams, visions, or fantasies of a mysterious person. You get a particular feeling and the energy of the individual feels familiar, as if it is someone you have already met in the past or someone you will meet in some unknown future. You have a vague feeling that this person is real even if you can not see a face or invent their physical appearance in your mind. You have a feeling as if this person is 'out there somewhere' and may even know who you are on the same level. There may be an unusual synchronicity or event that surround the initial meeting between first flames. Often you have a feeling or 'knowing' of something that you just can't quite put into words. 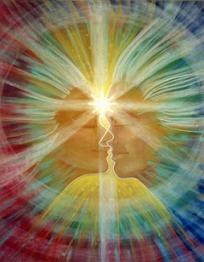 Twinflames often encounter each other for the first time (whether in person or online) in an unusual way. The twinflame comes into our life in an unexpected way out of the blue and usually there are synchonicities and strange occurances or major shifts in energy the same week of the initial meeting. Most twinflame couples are physically at a distance or live in different countries. Often there is something that prevents the twinflames from being physically together in the beginning. This is usually because there is much energetic work to be done on the mental and emotional levels before the physical meeting can occur. If the physical meeting were to occur too soon the energy can often be too intense. The relationship is immediate, as though no time had been lost since you were last together. You feel comfortable with them and you feel you can truly be yourself with them. Sometimes conversation seem to last forever and there is not much that twinflames are not willing to talk about. It's as if you could share your entire life with this person and there is a level of openness and understanding between you that brings a comfortable yet intruiguing sense of familiarity. You feel an overwhelming sense of love and attraction. This love is genuine and heartfelt and you feel magnetically drawn to their energy. This is not to be confused with lust or an obsessive love. Twinflame love is unconditional and transcends the ego. If you have found your twinflame it does not mean that the relationship will necessarily be free from issues or personal conflict. There may still be lessons and healing that must take place between the twin souls. Twinflames are still human beings on the physical level. You feel a sense of completion that goes beyond words. This feeling is about wholeness on a soul level that is beyond the physical. Each twinflame is still an individual and is not 'the other half of your soul' as if you are a complete soul now that you have found them. You are meeting an energetic mirror of your own soul. You share a vibration and you resonate with them. You even feel an attraction to the sound of their voice and it may even sound familiar to you. More in depth descriptions of each common and also unusual signs of a twin soul as well as the unique energy and characteristics of a twinflame connection.